I made aliya many years ago, and I have many unique experiences to share about the Land of Israel. This is just one of them, but it happened recently, and it unfolds almost like a mystery novel. It began when I saw one of the locals here in Ramat Shlomo (a suburb of Jerusalem), a man who everybody in the neighborhood knows lives basically hand-to-mouth, sitting in front of a table outside one of the local shuls (which has a broad plaza in front of it), selling grapes. He had piles of grape cartons behind him, enough to fill a truck, and a scale in front of him, and was weighing out kilos of grapes to customers. “You’ve entered the wholesale fruit business?” I managed to ask him. “Once every few years,” he replied, busy as he was. “What’s going on?” I said to a friend I spotted, as I pointed in a general direction to the impromptu Machaneh Yehuda shuk that was in full swing by the shul. “This is a maaser ani year [a year in which certain tithes of the harvest in Israel are given to the poor], and unfortunately, he qualifies as an ani [destitute man]. 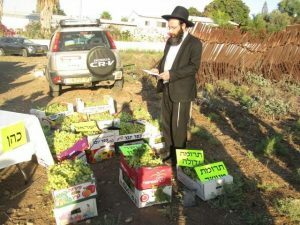 These grapes come from some organization that is mezakeh the bnei chutz laaretz with the terumot and maasrot, and he got the maaser ani [i.e., an organization that enables those living in the Diaspora to fulfill mitzvot usually reserved for those who actually live in the Land of Israel]. After the harvest, teruma is given to the kohen (Rabbi Shaul Reichenberg) and maaser rishon to the levi (Rabbi Meir Leibowitz, founder of Kinyan Eretz Yisrael). “Look, you’re a green grocer like I’m a brain surgeon. Ma pitom [what’s this all of a sudden] that you should be selling grapes by the kilo like in Machaneh Yehuda? 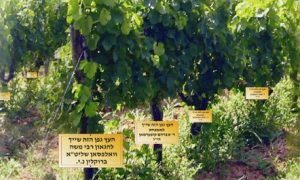 “The grapes came from an organization that is mezakeh the bnei chutz laaretz by doing the terumot and maasrot for them,” he replied. “Thank you, kol tuv,” I said. Now I had all the information I needed, or so I thought. I went straight to the nearest beit midrash, because you see, Rav Shaul Reichenberg is the last word, but the last word, on mitzvot hateluyot ba’aretz [mitzvot that apply specifically to the Land of Israel, such as tithing of produce and the Sabbatical year]. How I know about Rav Reichenberg is a story in and of itself. You see, in Israel, the fruits and vegetables are holy, either d’Oraita or d’Rabanan, but tithes have to be taken. Now, if you’re in a religious area, a hech’sher of some sort has already taken care of that, although many people are stringent to tithe again at home, without a blessing. In my case, once upon a time, I was offered a bag of lemons that came from a neighbor’s tree, and these were not maasered by anyone — what’s known as tevel gamur. He had given me from his tree before, but that was during the shemita [Sabbatical] year, when all the fruits are hefker [halachically ownerless] and don’t need to be maasered. This time I was in trouble, as my wife wanted to use the lemons, but I had no idea how to do a “real” tithing (i.e., not as a stringency). How much should I separate, and would that amount have enough value so that the maaser sheini could be redeemed onto a coin, or if I needed a peruta chamura (a coin that is necessary if only small amount of fruit is being tithed)? With these and other questions in mind, I took a volume of Rav Shaul Reichenberg’s sefer from the shelf of the beis medrash, found his phone number on the front page, called him up and got all the answers I needed. He even let me use his peruta chamura for the redemption …). That was many years ago, but I found the number, called again and asked Rav Reichenberg what he knows about an organization that is mezakeh the bnei chutz laaretz with the mitzvot of terumot and maasrot. “Of course, you’re talking about Kinyan Eretz Yisrael. It’s an organization that was started 13 years ago to be mezakeh the bnei chutz laaretz with the terumot and maasrot. I thought Rav Reichenberg was being modest. From these grape vines, the mitzvot of terumot and maasrot were fulfilled. The sign on the first tree to the left states that it belongs to Rabbi Moshe Wolfson of Yeshivat Torah Vodaath and Emunat Shmuel, Boro Park. Rav Leibowitz? Where did I know that name? I thought to myself. “Who is Rav Leibowitz,” I asked, although I felt funny chatting with a leading halachic expert over the phone, even if he is down-to-earth. Him? I was shocked. I know Rav Leibowitz! “Rav Leibowitz heads an organization that is mezakeh the bnei chutz laaretz with the terumot and maasrot?” I was almost screaming by now. “Thank you, kevod harav. Kol tuv,” and with that I hung up, and was really confused. A dayan who handles monetary cases in Ramat Shlomo, the kind who spends his days and nights poring over the Talmud and Shulchan Aruch. He heads an international organization, and in such a different field? If you had told me that the neighborhood ani is the president of some leading corporation, I wouldn’t have been more surprised. He smiled. “And if I do?” he asked. Yes, the grapes, that’s how this mystery started, I thought to myself. Rabbi Leibowitz declares which sections of the harvest will be designated for the various tithes as required for produce of the Land of Israel. “Uhhm, as a matter of fact…” I thought to myself. “And how do members know that you’re really doing the maasering?” (Like I said, only I can get away with such chutzpah). You could have knocked me over with a feather. You have to see the man I was speaking with. So unassuming, so engrossed in his learning, and yet such an idealist. And here in the neighborhood, no one knows anything about this international “side project” of his. That’s Eretz Yisrael for you! 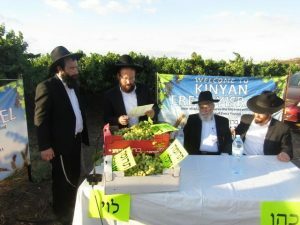 For more information on Kinyan Eretz Yisrael, visit www.kinyaneretzyisrael.com or email David at contact@kinyaneretzyisrael.com. They are happy to explain how one can increase the merits of the Jewish people through the mitzvos of the Land.